“Thousands of tired, nerve-shaken, over-civilized people are beginning to find out that going to the mountains is going home; that wildness is a necessity.” John Muir. To return is to go back to a former position, to turn and change direction, go back the way you came. So, a homecoming, Penelope at the end of the Odyssey. But you can speak of returning to a place as soon as the second time you go there, and every time after that. Every time you change direction, go back the way you went that first time, you consolidate that sense of the new place as a place of origin. Resort is a place you go out to (sortie) again and again. And so I keep resorting to the spring at the top of Mount Lemmon--back there, again there. I keep returning, transforming a resort into a source and base. Repeat, return. To repeat is to seek out a former place or state of mind. To go back to it. To find it again. To do it again. This is why the word “again” means the same thing as “back” (in the sense of “go back”). Recourse is literally a run or a drive back--go back where it’s safe; find the safe place again (drive back up the mountain, take refuge (= a place where you flee to), resort). Resort is a place you go out to again and again. You go back to it, away from your home base. You turn back toward it, return to it, and so you turn your place of resort into a place that feels like home, a place that you turn to again. And so I keep resorting to the spring at the top of Mount Lemmon--back there, again there. I keep returning, transforming a resort into a source and base. Each time, the plantscapes and cloudscapes are different. When I first started driving those 27 miles of twisty one-lane highway, I was constantly pulling over to let people pass. Now, people pull over to let me pass, or else I keep a safe distance behind someone going at a speed I’ve outgrown now I have the road memorized. When I first started hauling water up from the spring--it’s not far, but it is steep uphill, half a mile or so--I would be sore and exhausted for a couple of days afterwards. Now, I’m tired, but I seem to cover more ground with every step I take, it doesn’t feel quite so far, and I’m no longer sore. Repetition strengthens connections. Or, seek again, and keep finding more. I keep finding more. This was my second trip with monarda in bloom, and just knowing that I would be seeing stands of monarda everywhere off the trail, monarda in profuse enough abundance to gather, heightened both my anticipated and actual pleasure, eagerness to return. This time, it was 100 degrees in town--a little cooler than for my previous trips. My car a/c isn’t working, so by the time I reached the top of the mountain I was soaked with sweat. Meanwhile, the monsoon clouds had gathered and were in conclave. I was still at the car when I started to hear thunder. Every time I return, I repeat the pattern of shouldering up my not-yet-heavy but already-bulky backpack and immediately remembering something else I need from within the car. And so of course I try to reach it with the extra load on my back. Hilarious. This time, the extra item was the umbrella. All other waterproof gear was safely at home, but the umbrella kept most of the rain off, and I wasn’t cold. Ah, monarda, how I love that herb! In my herbal studies and adventures last year, it was in my top three favorite new friends, and through the fall and winter my preparations from it sustained me. It’s an American-continent oregano, with all the thymol and carvacrol goodness and deliciousness that implies. 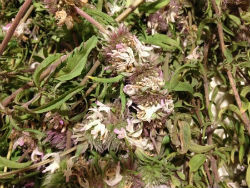 I was recently told that oil of oregano has antidepressant properties, and monarda definitely has that effect on me. It’s heating without being irritating; it’s palpably antimicrobial; it contains those antioxidant compounds that inhibit the formation of heterocyclic amines when protein is subjected to high heat (i.e. use monarda/oregano/rosemary when cooking meat, or beans, especially when barbecuing or frying). Last year, all my monarda was gathered at least 5 hours drive from Tucson, and I was under the impression she didn’t grow anywhere near here. The awareness that she’s flourishing just an hour or so drive away from where I sit right now is inordinately delightful and comforting to me. Kiva Rose, a great southwest herbalist, calls her “One of North America’s Most Important Medicines,” and I don’t take that lightly. (She has a great article about monarda here.) My friend and utterly inspiring herbalist Paul Manski has a wonderful picture of monarda at the top of his blog home page, and a short movie of which she is the star. The SEINET plant database has 45 different entries for monarda, although some of these are redundant. I believe what I’ve been gathering this year has been monarda pectinata, lavish with multiple flower bracts rather than a single flower on top. If that’s correct, I have a plant that’s higher in carvacrol than thymol, according to this chemical assay of essential-oil content of Colorado monarda species (whereas monarda fistulosa is the other way around). Carvacrol is the essential oil that oil of oregano concentrates for and is more antimicrobial (and apparently antidepressant); thymol is more specifically for coughs, sore throats, and fevers. What about the name? Monarda. It has the lilt of a mysterious beauty. Yes, it’s also called bee balm, bergamot (just to be confusing! ), oregano del campo/de la sierra, oswego tea (back east). But monarda, the genus name for all these different North-American species, was named for a 16th century Spanish botanist, Nicolas Bautista Monardes, who never even visited the New World but described plants that were shipped back to Spain for him to look at! The name Monardes doesn’t have an obvious or poignant etymology, and the botanist himself never saw a live monarda plant. And yet by some strange transfer of sound, those humming nasals mmmonnn opening into the aaa -- into the trilled rrr -- into the decisive da -- have an authoritative effect. The name is like a grand European ballgown for this New World rural fairy, dressing her up to the height of authority she truly commands.